Intermediate Perl 2nd edition’s second printing is now available. This contains fixes for almost all of the reported errata, but it otherwise the same content. If you’ve bought your ebook through O’Reilly, you should have it available in your O’Reilly account. Look at your O’Reilly products list. I have the Alpaca under mine and I can immediately download the format I want or send them to Dropbox. 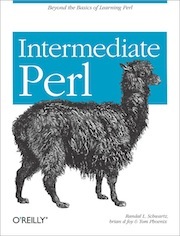 You can buy Intermediate Perl now, directly from O’Reilly in ebook form. For the next week, you can buy it for 50% off using discount code WKPER5. Every ebook from O’Reilly is DRM free and come in PDF, ePub, and Mobi formats. If you’ve authorized O’Reilly’s Dropbox app, once you’ll purchase the books they’ll sync to your Dropbox account (in ~/Dropbox/Apps/O’Reilly Media). You can read them on any device anywhere you are. The print version is still making its way out of the printers and to distributors, but we expect it to show up in the next three weeks. You can now buy Intermediate Perl. I’ve just submitted the final changes and the final publishing bits should finish this week, sending the result to the printers very soon. The book should ship before the end of August. If I haven’t listed your favorite bookseller, send a link. David Golden, one of the reviewers for Intermediate Perl, gave me extensive comments about one of the test program examples in the book. I made a simple example using Test::Output, a module I sometimes use but didn’t write. It solved my needs at the time, but it has some issues. Perl’s output is complicated, and the simple tie in Test::Output::Tie doesn’t cover all the cases. I’m the current maintainer of the module, and rather than explain the edge cases in my example (or fix the module), I merely mentioned to David that we should reimplement Test::Output with Capture:Tiny, his module that handles almost all cases. I meant “we” in the universal sense, and I didn’t say much because I was busy writing the book. A couple of hours later, David sends me a pull request. That often happens as part of the writing process. If something is too hard to explain, it’s probably too hard to use. The time explaining it is better spent making it clear, unbuggy, or whatever it takes to avoid the explanation. In this case, it’s even better when someone else did it.